I love opening a magazine and stare hours and hours on how they styled the spaces. But in reality, not everyone could have the very much fancy styled rooms in their house. I'm also one on that list. As accessorizes, decor and furniture tend to get expensive on this island, I'll do my best to style my rooms with things that are so easy to get and use. That is why I want to share some tips to style your bathroom cabinet. The bathroom is a room that doesn't get a lot of care and attention. Always kept for the last to style, especially when it's bathroom you don't share with your guests. In my case, I do have to share my bathroom with my guests, so I try to let it always look very tight. To be totally honest, I don't like a lot of stuff around me. When I see clutter I tend to clean up right after. I have two cabinets in my bathroom: 1. cabinet below the washbasin and 2. an open cabinet to store things. The one underneath the washbasin has drawers and mostly once a month I rearrange everything in it. And for that reason that one is messy most of the time. But the open cabinet I try to keep it clean all the time. This is one of the famous IKEA Kallax cabinets. The color is brown-black. When it was bought, I thought it would not be so dark, but after it was hanged on the wall I found it (still do) very dark against the wall. And oh my, the dust loves it even move. So for that reason I wanted to keep it light and not fill it up with lots of stuff. To keep the cabinet looking less busy, it's very important to have a cohesiveness of the color you are using. When buying towels, try to think of a certain color you would like to see for a very long while. If you go with neutral colors, you're hitting the safe spot. As you can see I have a variety of colors of towels. The very colorful towels, I got last year in the goodie bag of the Amara Interior blog awards. It put them together with my green and purple towels. The brown and creme color towels fitted well together and all the whites are put together. Some of the towels I have for ages, so now I just blend them in. 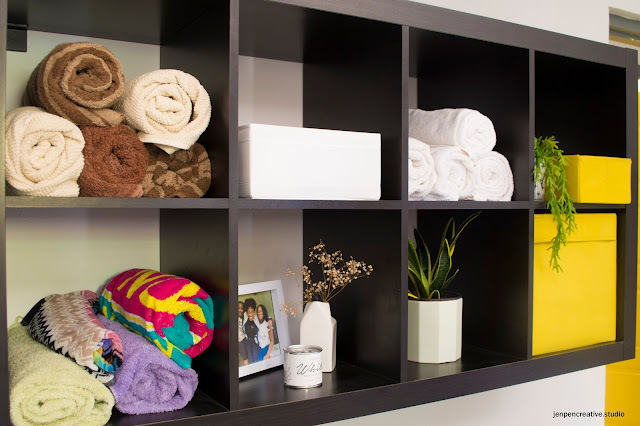 Even if you have different colors, put the same colors towels together so it will look easy to the eyes and it can be easier to add decor pieces. When adding decor pieces, look in the colors you have in your towels. That will also keep the color cohesiveness tight. 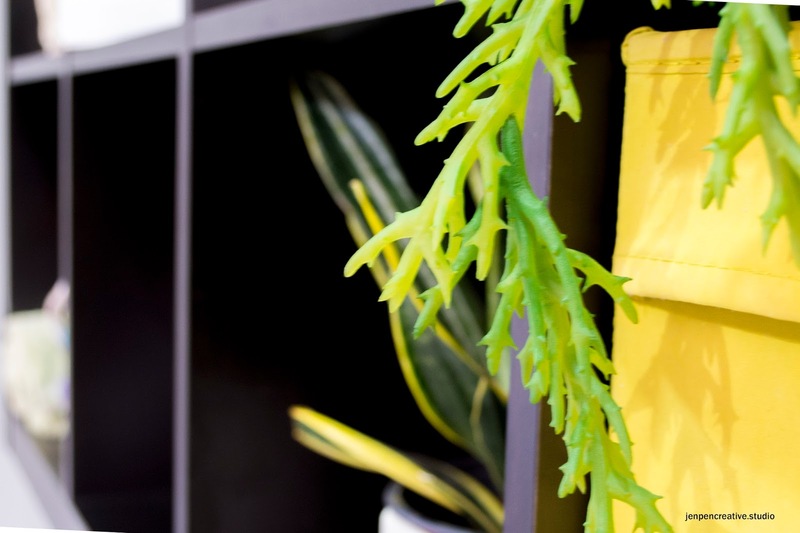 One way to always give a space style, is by adding plants or flowers to it. I did a combinations of a snake plant (which by the way doesn't need most water and sunlight...so if you a plantkiller like me, but you're a plant lover...sounds weird, but we exist...snakeplant is a plant for you), dried flowers and yes even a fake plant. Ofcourse, if you could go with live plants, always go with live plants. The white flowers (which I can't seem to find the name) are always great for beautiful decorations. When they're fresh, they are even more beautiful. But these types when they're 'dead' they still keep their looks up. 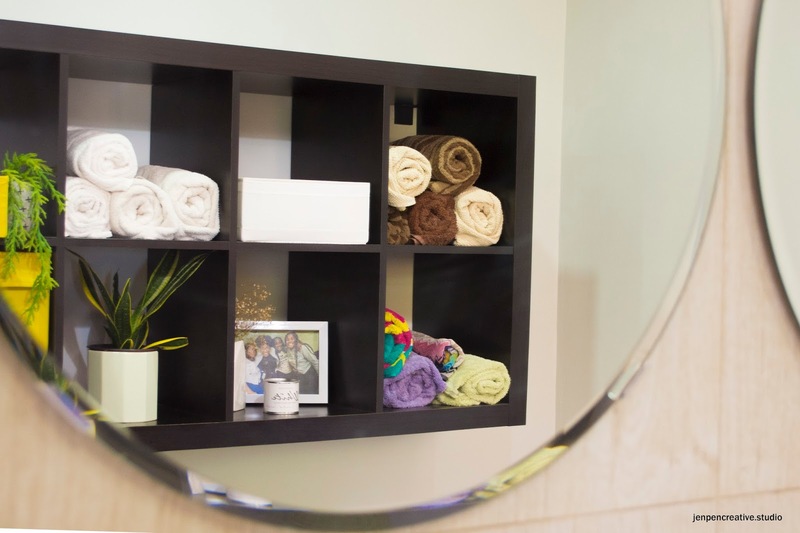 Yes, we all need storage in every room, especially in the bathroom. In this cabinet I used the very payable boxes of IKEA (once again). I store in them my PJ's, paper rolls and my underwear. All nicely hidden away from the eyes. Once again, when searching for storage boxes think about the color or even the material you would like to use so they also can have a cohesiveness. 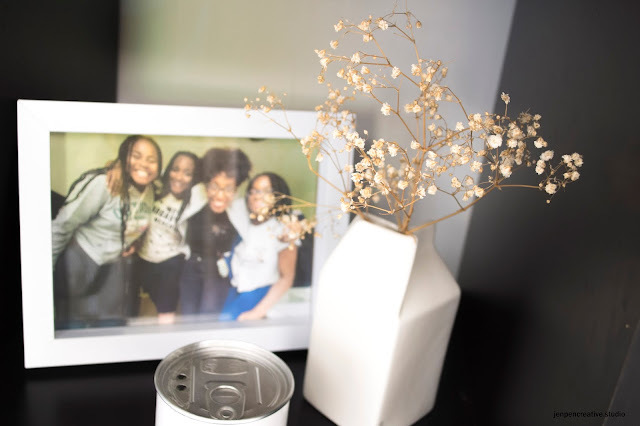 To finalize your styling, you can add candles, pictures frames with family pictures or your favorite quote to get you started in the morning. I've added just one scented candle which I bought last month at Jill & Co and added a picture of my sister, myself and my nieces. Just to add that personal touch in my bathroom. Here I paired all the white elements together and brought color into the mix by adding the picture. The ceramic milk jug vase, I also got in the goodie bag of the award show. What do you do extra in your bathroom to give it your own personal touch? Share it with me in comment section below. Those are some great tips. I love live plants in my house but they are so difficult to maintain. How do you keep the dampness in the bathroom, in control ? Most of the time the windows are open, so I don't have a huge problem with that. But you have to look out for plants like snake plants or cactus. They do good in many surroundings. Great tips!will come back to it once I decide to settle but as I'm traveling I absolutely love the neatly organized spaces.